A "business" shall include all kinds of vocations, occupations, professions, enterprises, establishments and all other kinds of activities and matters, together with all devices machines, vehicles and appurtenances used therein, any of which are conducted for private profit or benefit, either directly or indirectly, within the Town. It is unlawful for any person, whether as principal or agent, clerk or employee, either for himself or for any other person or for any body, corporation or otherwise, to commence or carry on any kind of lawful business, profession, vocation or occupation in the city without first having procured a license from the town or to do so without complying with any and all regulations of such business, profession, vocation, or occupation contained within the Silt Municipal Code. Please click HERE to download a business application form. Once finished, upload using the form below. If you have any questions, please call (970) 876-2353 Ext. 104. Thank you. 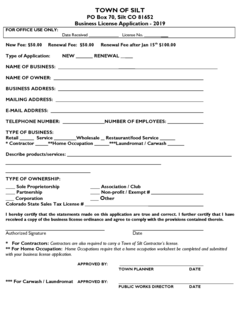 List of 2019 Business Licenses, to date.